Rococo villa in a ferme ornée. Veltrusy, once a medieval village in the lower Vltava basin, were surrounded by fields and forests; in 1698, they were included in the inheritance of Maria Theresa of the Scheidler house as part of the domain Jeviněves-Veltrusy. In the same year, Maria Theresa married count Wenceslas Anton Chotek (1674-1754). The Chotek house belonged to the old knight aristocracy affected by confiscations after the Battle of White Mountain, and the marriage of Wenceslas Anton was beneficial in material and social terms. He was granted the titles of baron and then, in 1723, count; apart from that, his wealth increased considerably, and so did his life and cultural standards. This increase in standards was also reflected in the requirements for the representative residence, the building of which started in 1704. From the start, the chateau was projected with a generous Baroque concept, as a set of buildings with different height built along the north-south axis around a courtyard. The main building featured a central cylindrical core, one floor higher than four single-floor wings in the shape of St. Andrew’s cross. The representative rooms were located on the first floor. On the north side of the courtyard, there was a row of allegoric sculptures of months and seasons. 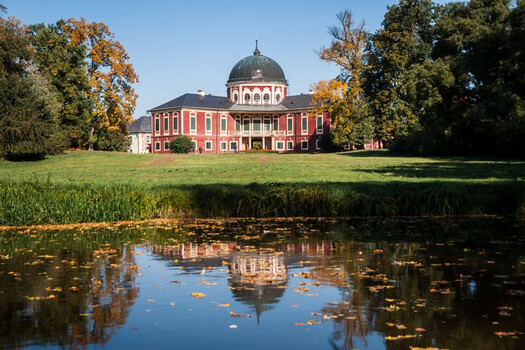 In its original design, the Veltrusy chateau belonged to the most important architectural works of high Bohemian Baroque, despite its later modifications. Even though the original plans have been lost, the chateau is certainly closely linked to the work of one of the leading Baroque architects in Bohemia, Giovanni Battista Alliprandi. During the construction, according to the agreement between Wenceslas Anton Chotek and his sons John Charles and Rudolph, the chateau became the property of the latter. Rudolf (1706–1771), the younger son, followed his father in building the Veltrusy chateau, and also in important state functions in the imperial court in Vienna (especially in the service of Empress Maria Theresa). Since 1749, he was in charge of various institutions that controlled the financial and business policy of the empire. The Veltrusy residence failed to keep pace with the requirements for representative areas that were growing with Rudolf’s rise, so a new yard was built around 1740, to perform various economic and operational functions that were removed from the buildings around the original courtyard. After 1750, Rudolf Chotek built an extension of the main chateau building that doubled the original length of the wings; later, the side buildings around the corner were connected together. Chotek also bought more land around the chateau. In August 1754, Maria Theresa (1717–1780) visited the chateau on her inspection tour to the Czech lands, upon the invitation of Count Rudolf Chotek who at the time organized “The Grand Fair of the Goods from the Czech Kingdom” in Veltrusy. In fact, it was the first fair in the world that used samples and catalogues. The products were exhibited in and around the chateau. The purpose of the event was to show the advantages of manufacturing and also present and promote Czech manufactures. For his merits, Rudolf Chotek received one of the highest awards of the Habsburg Empire – Order of the Golden Fleece. 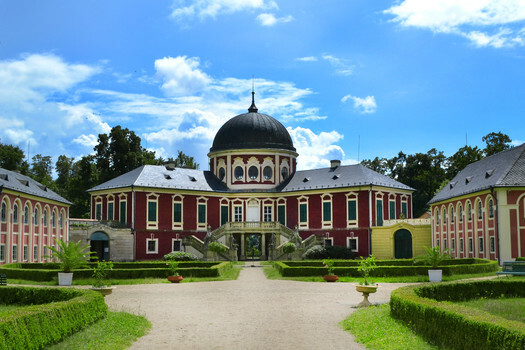 During the era of Jan Rudolf Chotek (1748–1824), the development of the chateau park in Veltrusy reached its peak. Like his ancestors, Jan Rudolf Chotek was a well educated man, and pursued political career, but also science and art. In 1782, he was appointed the chancellor of Czech-Austrian Court Office, but later left this position in disagreement with some of the reforms made by Joseph II. Since 1784 he actively managed the Veltrusy domain. The immediate impulse to work on “the Island” (a natural result of a flood in the beginning of the 18th century) was a series of floods in 1784 and 1785, affecting the new concept of the Veltrusy park and also the first regulation of Vltava. Thus, the area turned into a large natural park - ferme ornée, with fields and other areas with economic use not only being a natural part of the park but also an aesthetic feature. In the late 18th and early 19th century, a lot of small architectural works were built in the park – pavilions, bridges, or sculptures. This period is marked by the work of Jan Filip Jöndl (1782–1866) who made numerous architectural projects for the Chotek family since the start of the 19th century. After 1804, Jan Filip Jöndl also helped rebuild the chateau in the classicist style. Another floor was built on the side wings, and the conical roof of the cylindrical core was replaced by current dome. Also the Baroque façades were removed. When Jan Rudolf Chotek died in 1824, the domain consisted of a chateau, eight courthouses, six sheepfolds, a brewery, a winemaking cellar, four lime works, a lime quarry and a mill. After the death of Jan Rudolf Chotek, all the family property was inherited by his grandson Jindřich Chotek (1802–1864). During his life, the blooming of Veltrusy continued, as more land was added to the domain. The second half of the 19th century was the period of decline for Veltrusy, due to the dragging economic crisis and also the irresponsible lifestyle of the next owner Rudolf Chotek, the eldest son of Jindřich. He couldn’t cope with the loss of his own son, so the economy of the domain declined, the yards were rented and so were the industrial plants. The last owners were Karel and Livie Chotek; at their time, the chateau was occupied by the German army during WW2. In May 1945, the Germans were replaced by the Red Army; for several months, the chateau became the seat of the regional headquarters. After the war, the last owners left for Germany and both died childless in 1970. During the war, Veltrusy declined steeply; after 1945, the chateau and the park were declared state cultural property pursuant to Act No. 137/1946 on national cultural committees. They were listed among the heritage sites with further cultural and educational use. Since January 1, 1947, the chateau was managed by the state; public access was planned for 1948. Until 1950, buildings in the park were repaired, and so was the main building. The exhibition should have presented the housing culture of late Baroque, so the interiors were fitted with furniture and other equipment from other buildings. In the end of the 1980s and beginning of the 1990s, a major reconstruction returned the Baroque façades on the main building, and the façades of the wings were unified. Currently, the area is managed by the National Heritage Institute, and in 2002 it was declared a national cultural heritage site. In the same year, the whole area was severely damaged by a flood. Gradual revitalization has been going on ever since. During last years, several buildings in the park were renovated, including the orangery, the main entrance gate and the surrounding houses. In 2014, all bridges across Mlýnská strouha were repaired, as well as the northwestern wing. The main building of the chateau is still in reconstruction. The area is managed by the National Heritage Institute.